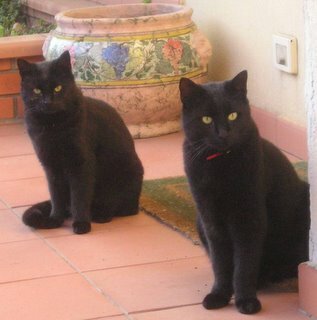 It's turned cold here! 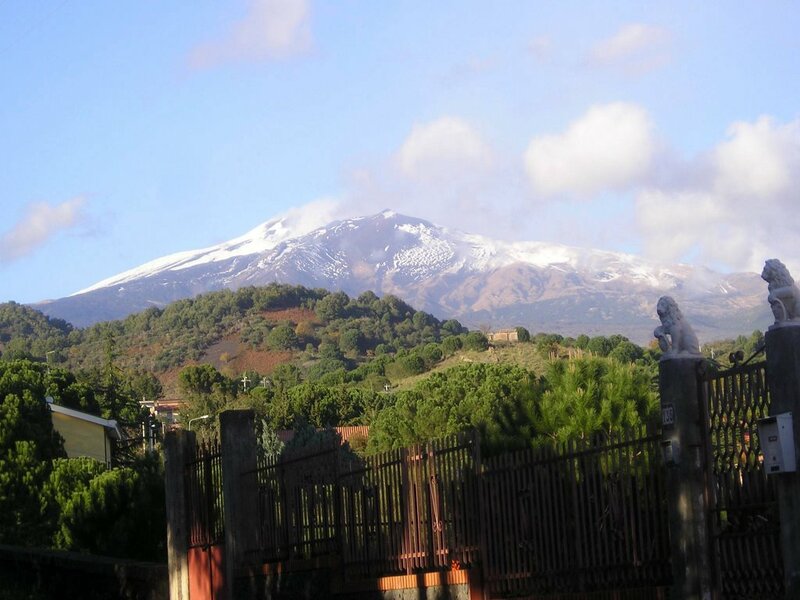 Look at the snow on top of Etna. This was taken from 3000 ft. on the street where I live. 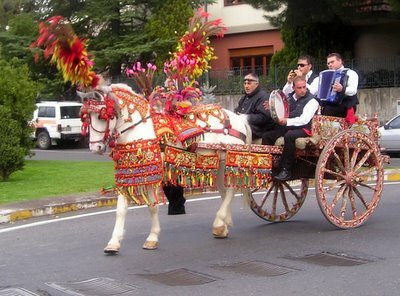 This traditional Sicilian horse and cart just happened to be a few blocks from home near my Sunday morning cafe today! My friend Pat invited me and another friend to go and buy olive oil where they actually make it last Sunday. This place is a real family operation only about ten minutes from my house. When we got there, we found out we would have to wait while they pressed it and bottled it for us. So, within the space of an hour, the olives went right from the basket to five-liter containers for us! You can't get it much fresher, can you? I had never seen olive oil making before, and generally I don't like those types of things. Years of touring breweries, wineries, and distilleries, mostly in Germany, convinced me of the ho-hum qualitiy of such operations. I mean, who cares how it's made?? However, this was a bit more interesting. For one thing, the entire operation was in one big room, probably the size of about four garages. Cases and cases of fresh olives were stacked up outside, waiting to be pressed. This was the place the locals brought their olives to be pressed for their own oil use, primarily. The tile floor was slippery from years of oil-pressing. First, they weighed the olives and recorded it. 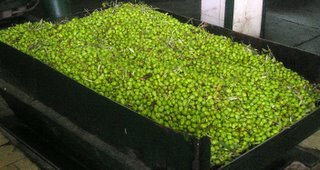 Next, the olives were put by hand into a sorter-masher that spit out the seeds and leaves and crushed the pulp into almost a paste. That paste came out of a spigot in a round pattern on a large flexible disk, probably about 2.5 feet in diameter. A worker put the disk with olive pulp on a spindle, stacking them up probably 3-4 feet high. When it got to that height, he rolled it over to one of the four presses in the room and put the whole stack in the press. Over the course of about an hour, the huge press squeezed all the oil out of the olives. It dripped and rolled down the sides of the disks and into a tray where it was strained and then siphoned to a holding tank. The Sicilians were there with all sizes and kinds of containers, both glass and plastic, which were then filled from a spigot by the head olive-man. He then weighed it again and charged them by weight. This is the greenest olive oil I've ever seen, greener than you will ever see in a store, and it smells wonderful. We didn't participate, but the regulars were actually drinking the oil in little shot-glass sized paper cups. Don't ask if this is virgin or extra-virgin--there is only one kind of olive oil in Sicily, and this is it! When I tap my gallon container, I'll let you know.